We’ve taken our own advice about summer cat care to heart. Hello, dear ones. 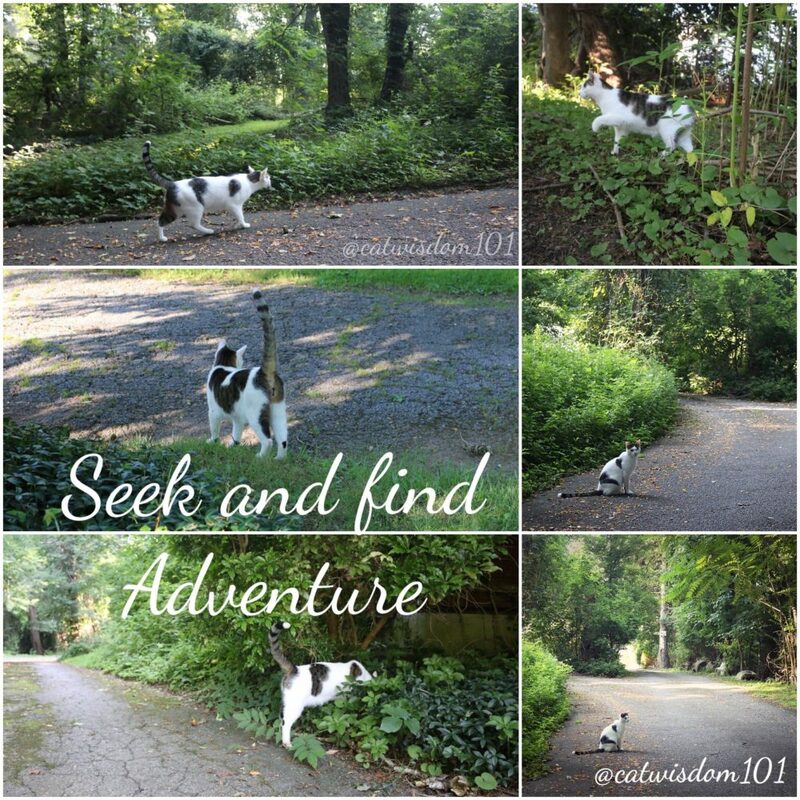 It’s Adventure Cat Odin here today with the best summer cat care tips and bonus cat wisdom for you humans. My #1 tip is to not work too hard. Follow the photos on my adventures outdoors. Clyde, our hard-working editor agrees and is taking a break this week and wishes you a clawsome week! I’m an early bird (bad pun, I know) and my mom, Layla is a night owl with a sleep disorder so we’re rarely together for early morning walks. Sometimes our paths and sleep cycles cross and I get to show off my favorite activities. Every day is an adventure! First things first is the basic feline exercise 101 like stretching, rolling around and jumping before walking. After my rounds are done, I like to bathe. Don’t tell anyone but I treat our next door neighbor’s property as my own. Fortunately, they’re nice and don’t have a dogs like our two other neighbors. Ha, those dogs are stuck behind a fence but they at least they have a pool. Somehow I don’t think they will be inviting me to a pool party anytime soon. 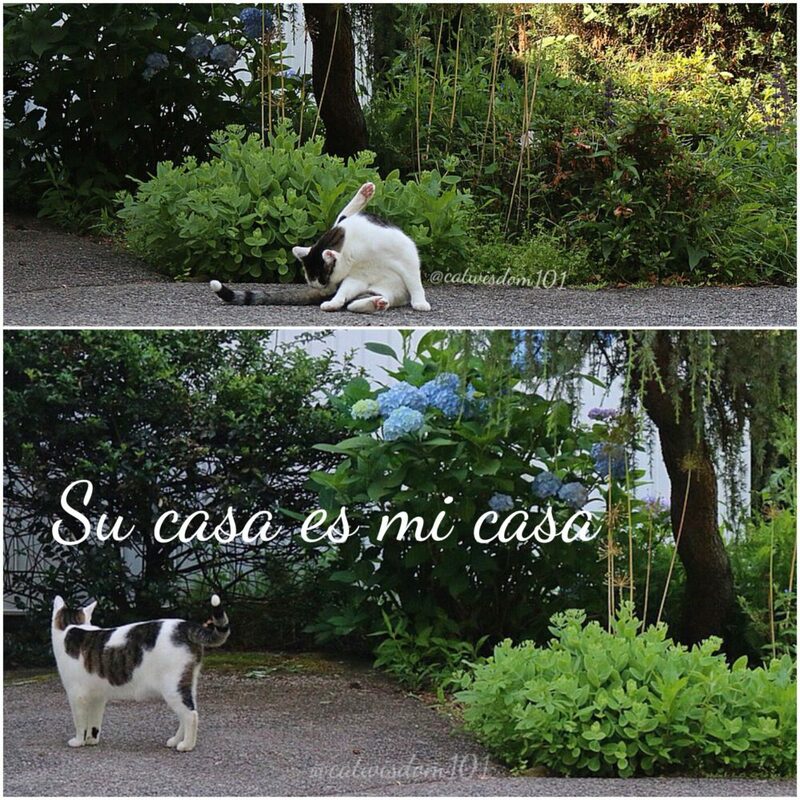 I’m mi casa e su casa friendly to everyone and su casa e mi casa. It’s important to stay hydrated in the summer heat but don’t drink pool water or from mud puddles. Did you hear about the dog in Florida who died from drinking too much salt water? That’s a new one and good to know the risks. In the summer heat, I’m not as crazy as I used to be in my younger days climbing every tree. I pause and observe between sniffing. Territorial sniff patrol is hard work but someone has to do it. Just because I’m sitting pretty, don’t think I’m slacking. This is a private road and safe but I’m always alert. You never know when a furry snack is waiting in the bushes. Oh, hello dear. I didn’t mean you. Have you seen any bunnies? No? Chipmunks? I didn’t think so. Peace. I’ll be on my way. 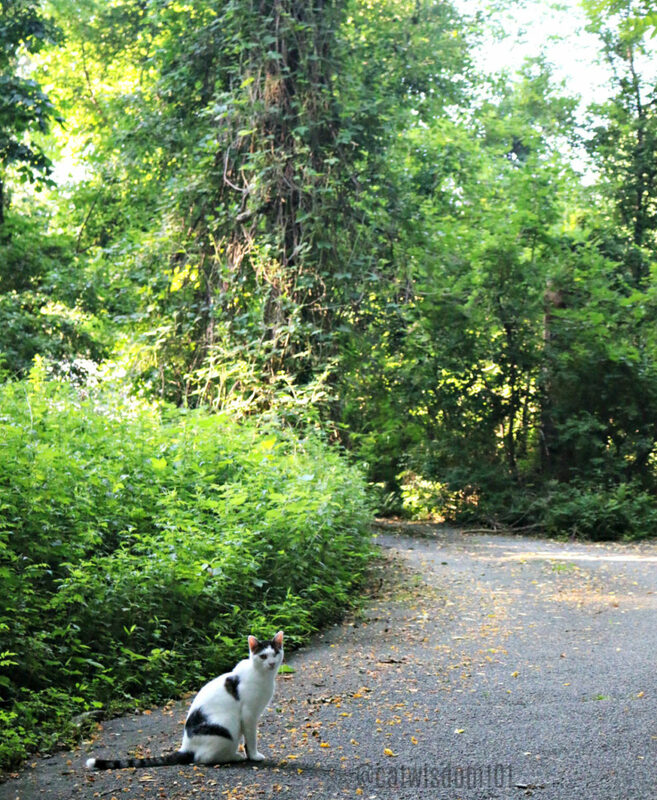 to the memorial garden where we like to pause and be in the meow. The raspberries are getting ripe. Mrs. 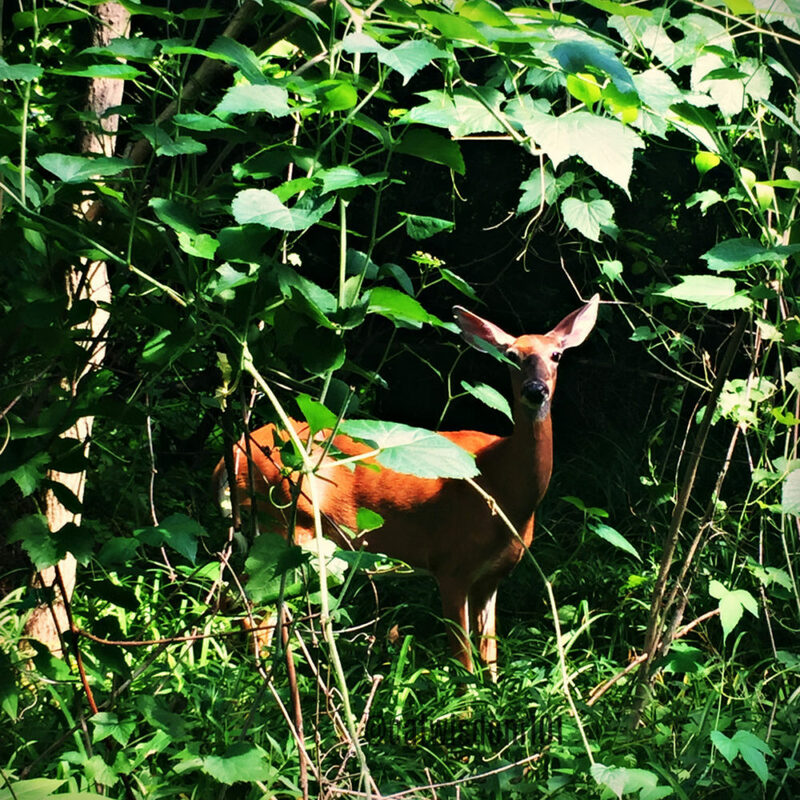 Deer loves berries and ate most of our flowers. I would never do that. I’m an obligate carnevore and must eat meat. 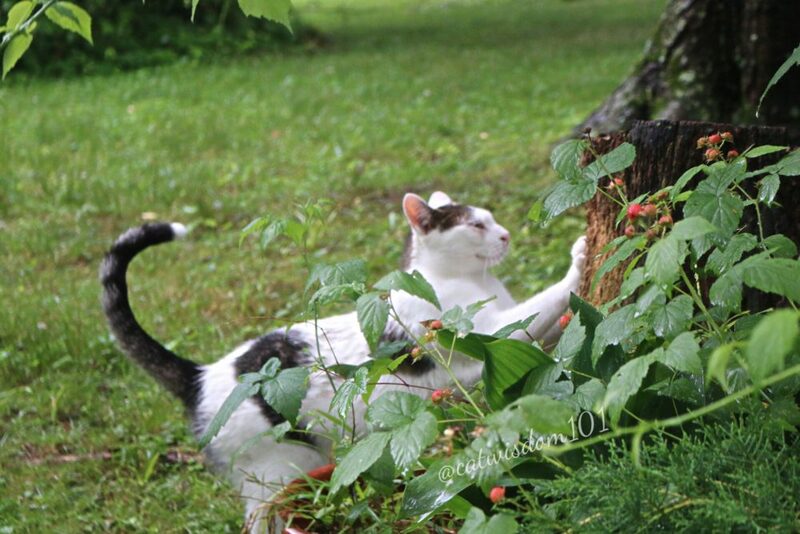 This is one of my favorites scratching posts. I have ones I like to use for grooming and others like this one for scent marking. Cats sweat through the paw pads which leaves a scent marker for other cats. There is a black and white cat from a neighbor two doors down who thinks our property is his. The nerve! This tree stump is a major scent crossroads where I leave pee-mail to make a point. It feels so good. All that exercise makes everything flow, if you know what I mean. Ah, this soft mulchy pine is the best litter box ever. Mom, excuse me! After my work is done, it’s time to let go and I do, completely. 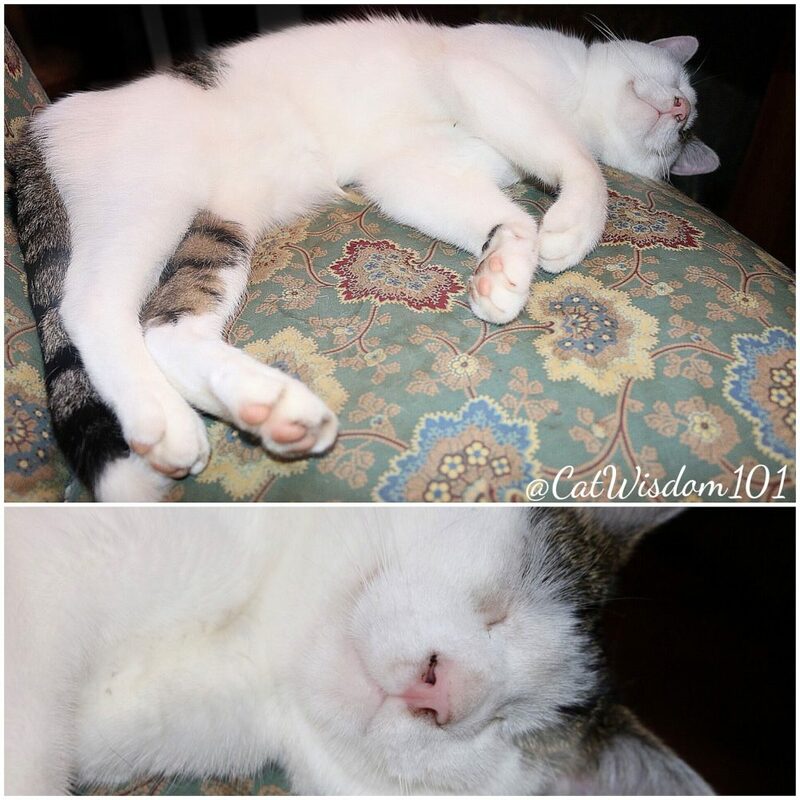 Unlike most cats, I’m so active during the day, I don’t cat nap. You will never see me with one eye open. Sorry, another bad pun from a one-eyed cat. Seriously, I’m a sound sleeper. Have a peaceful week. Get some dirt under your fingernails or nose like me and breathe in the natural fullness of the season. 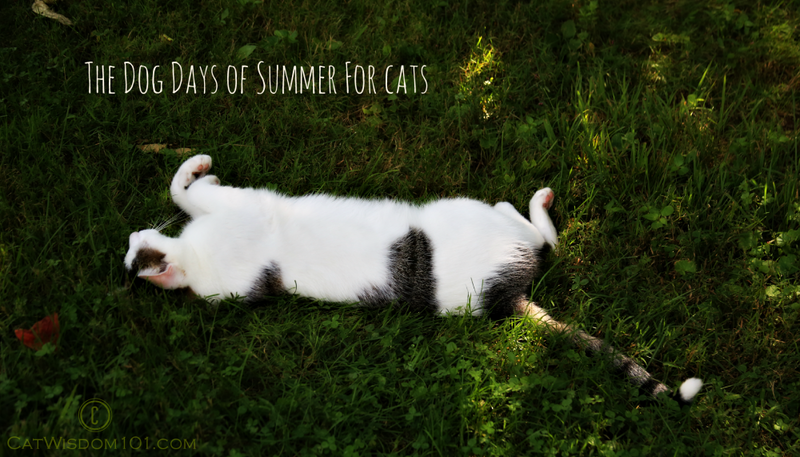 Enjoy the dog days of summer for cats. 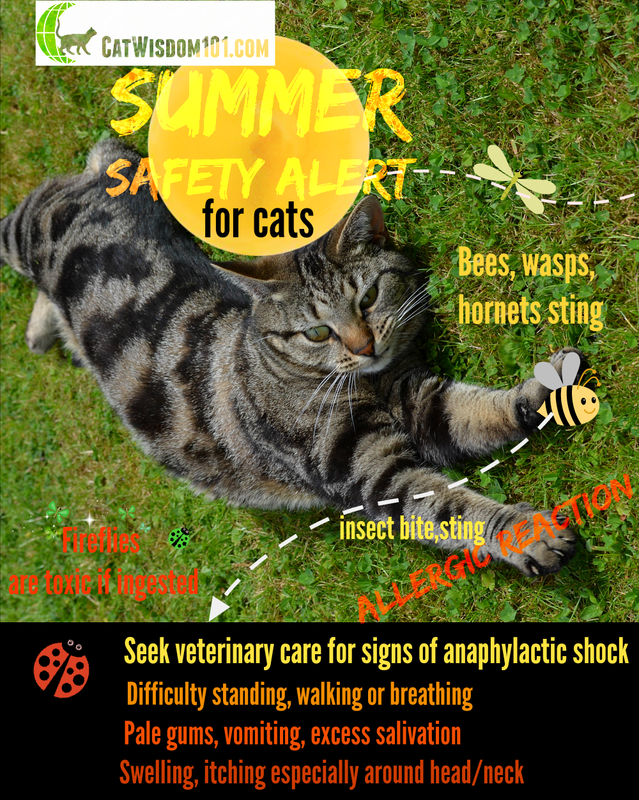 And if you haven’t read our Summer Cat Care complete guide to summer safety for cats, here ya go. Thanks, guy. 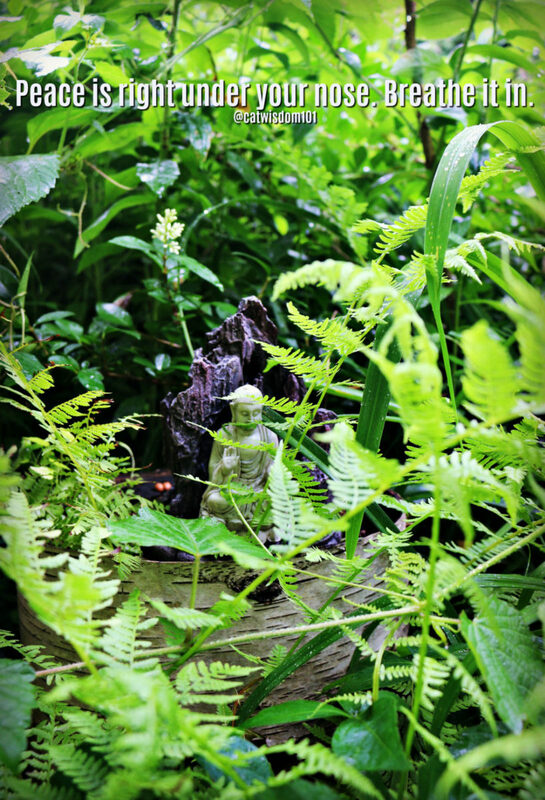 The blog has many nice pictures. And maybe background near the forest? 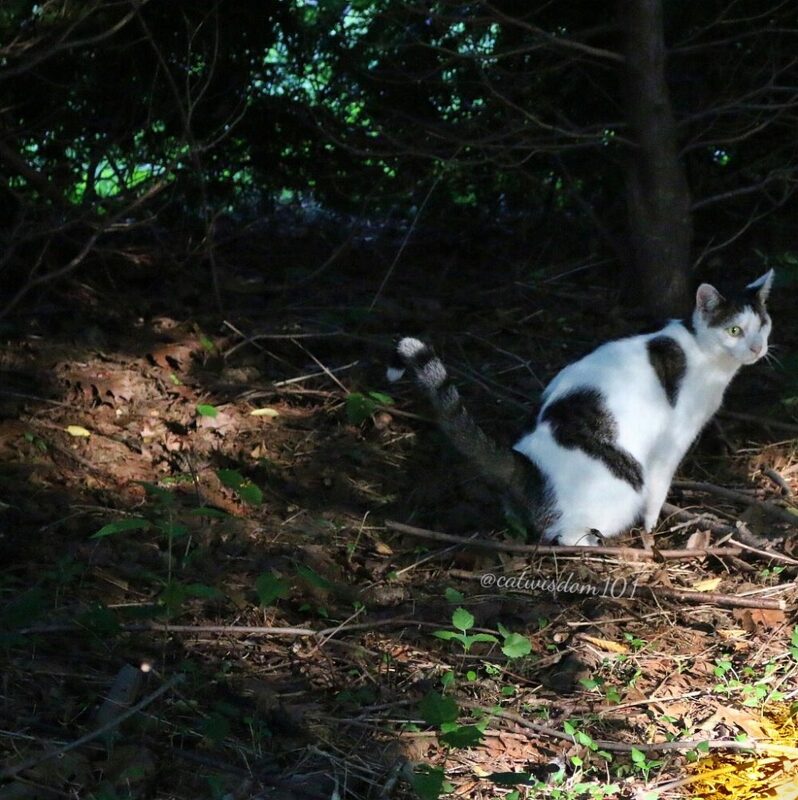 How do you keep your outdoor kitties from getting fleas? Is there a good treatment you’d recommend? I’ve tried some before but they never seem to do anything. Or are they lucky and just don’t get them? I let my cat outside to play one day and he got fleas from being outside just that one time. I haven’t let him out since, but I still want to because he loved being out in the grass so much. I had no idea that fireflies were toxic! Thanks for telling us. I loved seeing all the pretties of your terrain, Clyde! Peaceful and full of nature’s blessings. For some odd reason my comment didn’t post yesterday. Thanks for sharing your adventure Odin! It did post and I replied 🙂 Odin sends a big kiss. This is not only educational but the most thoughtful and lovely post. 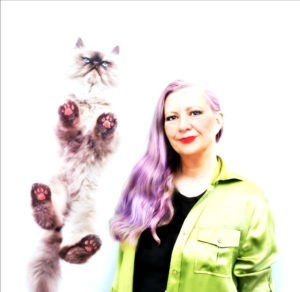 Thank you Odin for being such a creative muse to your mom. How nice that you get to roam and wander, Odin! My life is much more structured. Thanks for sharing your day with us Odin! We love to explore every nook and cranny too. Hello to Clyde and the rest of the gang! You sure are enjoying yourself, Odin. Thanks for taking us outside with you. We don’t get to go out very much. Odin, you look purrfectly at ease in the woods! You mean on my toilette 😉 Yes, I’m an au naturelle boy. I’m kinda on the same page, Odin. Just last night I was lying in bed appreciating the wonderful summer sounds. This week is cooler for us so I’m taking advantage of every moment. Nice digs! The indoor cats don’t normally go outside. Minnie though did have an adventure. She is a rolly polly cat for no apparent reason, she is just round. No over eating just lazy. Anyway, she decided to go through a screen in the living room because of we think fireworks from one side . She ended up with a giant scrape which luckily is healing nicely. She is a former feral, so did OK outside although was a bit overheated. The outside cats are glad the fireworks are mostly over. Still dumb humans shooting them off but not so frequently. Punchy continues to decline (when isnt he) yet hangs in there. I am beginning to think this cat is Methuselah, but he is so friendly to humans now in his old age. Still punches everyone on the way to morning meal and he just had his mid morning snack. I think he is staying around because he is so babied. I miss Clyde, tell him hello from the land of the lazy Iowa cats. You are too funny using the mulch for litter 🙂 Great photos of you. Love the deer! And Odin… And everything summer. We are indoors cats here – Ched and moi. What a beautiful outdoorsy post. Love Odin. He is so beautiful, calm and… sleeping. We don’t go out of doors. Ched here loves to do what apartment cats do. Eat, sleep; sleep, eat. Lather, rinse, repeat. Cheddar is sleeping now… And hiding. The Comcast guy came. And left within 30 seconds. We have tons of mosquitos – literal blood-suckers and while Mom and Dad wear some protection, I’m just OUT THERE like a walking buffet! Anyway, my favorite avoidance technique is going UNDER a shrub. I lie down on the cold ground and snooze while Mom and Dad keep an eye on me. Stay cool Odin – but then you’re one very cool cat so you’re cool all the time right? Just like me!! !